We serve our community by creating the best family atmosphere for the physical and intellectual growth of our members through our basketball programs. Our goal is to teach the fundamentals of the game in a very structured environment, be a good role model, emphasize teamwork, create a fun environment and encourage the efforts of our members. For individuals who like advancement in Basketball, our program creates opportunities to have better chances in getting in high school and college scholarships programs. 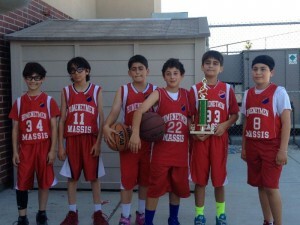 Basketball division is committed to develop and organize various activities, such as Tournaments, clinics, camps, and other similar activities to reach our division objectives. Divisions are set according to an athlete’s year of birth, regardless of his/her exact birth date. AAA Division 1973 OR BEFORE Note: Players must be 40 years of age or older on the first day of the scheduled start of the tournament. AA Division 1983 OR BEFORE Note: Players must be 30 years of age or older on the first day of the scheduled start of the tournament. Athletes participating in B division or below may participate in higher divisions with chapters’ permission. An athlete may not participate in a division which is more than 1 division higher than their age division, without the permission of the RAC. The youngest age an athlete can be to participate in ANY Homenetmen organized games shall be born in the year 2013 or BEFORE for the year 2017.